What do you do once you know that you have it? Along with 150 concerned Port St Lucie residents in attendance was also PSL Mayor Patricia Christensen and the Michelle McGovern, the regional director for FL Senator Bill Nelson’s office, and our local News Channel 12. Click here to see the news video. The turn-out of concerned residents was overwhelming as people packed into the room leaving some citizens standing because there were no chairs left. Leading the meeting was attorney Frank Toral who has a satellite law office in Port St Lucie that has been affected by Chinese drywall. Mr. Toral went over how you can determine – on your own – if you have the toxic drywall and then what you can do. I had written a previous article about the specifications from the Department of Health. Large glossy photos of the destruction from Chinese drywall were sitting on easels in the front of the room to display the damage that the sulfur compounds cause to copper wire within electrical outlets and A/C units. What was painfully apparent was that because this situation is so new and has never been dealt with before, the “officials” haven’t come up with standards and regulations on how to handle the removal of the drywall and any relating health hazards that it could possibly have. Many of the answers to the urgent questions were “we don’t know yet,” or “they’re still researching it.” But one fact that was brought up over and over again is that if you DO have the drywall then you MUST report it. The state and federal government will (hopefully) act quicker when they know that many homeowners have been affected. 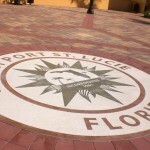 A form was passed out showing that St Lucie county, as of April 14th, had over 20 cases. An inspector spoke up and said that he’s tested over 200 homes in Port St Lucie for the toxic drywall and at least 100 of them had it. This goes to show that owners aren’t reporting the drywall to the correct departments to help raise awareness. Write a letter to your builder. Put your builder on notice that you’ve done a self-inspection and that your drywall meets the criteria set forth by the Department of Health. Ask if there is a remediation plan in place? Write a letter to your home owner’s insurance company. There could be a possible exclusion in your policy for “latent or hidden defects to construction.” But you won’t know until you bring it to their attention and ask. Ask your lender for relief or for mortgage payment abatement. Mr. Toral said that he hasn’t had much success with this on behalf of his clients but the more people asking for relief will bring awareness and eventually the banks will take action. With a wince, he noted that if a home has the bad Chinese Drywall then it is now TRULY a “Toxic Asset” and the bank needs to know that if the owner were to try to sell it there would be no market for the house and thus have no value. Most interesting to me was the question and answer session among our residents at the end of the presentation. Attendants posed some very good questions and I thought it might be beneficial to relay those questions here. Note: a lot of questions did not have a definitive answer – but I felt they were good to post. If you know an answer to one of these questions or have had experience dealing with one of these issues – by all means – please post a comment at the bottom. Q: Does bad drywall contaminate good drywall? Q: [Directed to Mayor Christensen] Will the city consider reducing taxes? A: From Mayor Christensen – At this time the Mayor was just learning about the specifics of the situation just like the residents in attendance and could not speak on the topic as to what the city would do or if they even could modify the taxes. Q: Once owners within a home owners association (HOA) find out that they have the tainted drywall, it’s possible that they will walk away from their properties and leave the community to be a ghost town. Will this create a ripple effect and what can be done to avoid causing a mass exodus leaving ghost towns? A: Get together as an association and community and build awareness. There is power in numbers and the more voices speaking together will be heard. As an example, 150 people showed up for this town hall meeting. Q: What can a renter do? Specifically if there is 5 more months left in a lease? A: If you suspect there is tainted drywall, do the self-examination following the criteria set forth by the Department of Health. If you have it, put your landlord on notice by writing them a letter. Q: Don’t builders know who they’ve purchased their drywall from and can pinpoint when and where and who it came from? A: This drywall came in from overseas on huge containers and was mixed together and after going back through the records it’s been found that whomever imported it did not keep specific notes on who and where each slab of drywall came from. They do know a time-frame, though, of when the tainted drywall was shipped in. It’s still so early on that the research is being done to track down who purchased what from whom (and even if those records had been kept). Q: Have the Chinese been affected or has research been done? Q: Will drywall affect a 10-month old child? As a renter, what if I don’t have money to move? A: Put your landlord on notice. Go to the doctor to have yourself and your baby checked out. Get it on record that you’re being proactive and concerned about your health. At this point a resident stood up to make a personal statement asking if Frank Toral, as a lawyer – or any lawyer for that matter – could partner with the City Council to take action? Mr. Toral responded that the citizens, uniting together, can get things achieved just as if a lawyer were working on their behalf. Can there be a class action law suit? Mr. Toral’s response was that he is not handling class action law suits but only individual cases. Then it was stated that the citizens should group together to create a task force to bring awareness and make progress. Q: Who let the tainted drywall in? A: Mr. Toral responded that he doens’t know the “who” but he does know the “why” – because it was cheaper and at the time there was a huge demand for homes and not enough supply of drywall so builders imported it cheaper from China to get the jobs done. Q: Did the drywall meet Federal approval? Q: Does liability follow inspectors who are inspecting homes? Q: Why can’t the drywall companies be held accountable? Q: How can a Doctor discern if symptoms are from the drywall exposure? A: At this point, the doctor may not be able to discern if the exact symptoms are from the exposure to the drywall but it’s important to get it on your medical record that you did visit the doctor and that the doctor did note your symptoms. The government is currently working on connecting health hazards (symptoms) related to drywall. DO NOT try and remove the drywall yourself to save money. The sulfur within the drywall has different reactions to different materials. The contractor had found that the chemical make-up of the drywall while in the home had CHANGED by the time they got it to the testing facility! The electricity in the home and the copper piping causes the chemicals to change. You should contact an environmental engineer to remove the drywall or give guidance. There is no instruction yet on how to dispose of the drywall and whether or not it’s considered hazardous waste. Q: Have any cases gone to trial? Q: Do lenders have an obligation within their pool of assets to disclose that a home has Chinese drywall? A: As of right now, no. “If we had another hurricane it would draw attention and the government would take quick action. “The media needs to continue broadcasting the troubles of this drywall. Q: What timeline or when will we know the results of the research that the officials are doing? A: On May 21st the Department of Health is going to issue another statement. Their last statement in April was the criteria on how to determine if you have Chinese drywall. Q: The city is able to mass-telephone all the residents when there is a missing person. 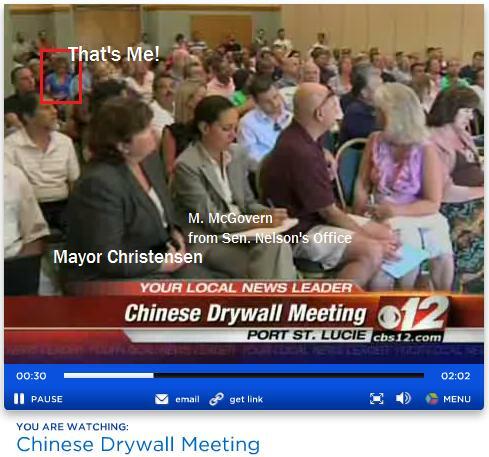 Can they do that to all the citizens to let them know how to check for the Chinese drywall to build awareness? An inspector that inspects specifically for Chinese Drywall stood up and made the statement that he had confirmed approximately 100 cases of the drywall damage. Mayor Christensen urged affected citizens to contact not only the FL Department of Health, but also contact the local St Lucie Department of Health at 772-873-4931. Q: Are there any reports for sulfur toxicology in the past? Meaning, do we know the affects of sulfur from past issues or bad experiences that we could apply to this current situation? Q: The Mayor is here but where is the representation from the Building Department? This drywall has to be permitted – why isn’t the building department here addressing the situation? A: From the Mayor – the building department is waiting for direction from the State. We’re waiting on the Federal Government to give us direction on how to remove the drywall and what the best remediation process is. Contact your local representation and put pressure on them. Mayor Christensen stated that she would be contacting the local reps tomorrow to start putting the pressure on. Attorney Toral stated that residents down south in a community called Parkland met constantly to take action and make everyone aware. They made the news and had tons of press because they banded together to work to get results. We need to do that in Port St Lucie to make awareness and lead to action and results. FEMA can’t step in and help until Florida is declared a State of emergency. Personally, as a Realtor, I have an interest and commitment to see that something is done QUICKLY for remediation of these affected homes. I have committed to joining a task force and action committee to help bring awareness, publicity, and – ultimately – results. Please comment below if you have news or insight or even a personal story to share. My website gets high traffic daily and the topic of Chinese Drywall is widely searched for. So your thoughts and comments will provide great use to others if you leave them below. Contact me if you need help finding an inspector or need general information that you couldn’t find online. I’ll do my best to point you in the right direction. You are famous!in a blurry kind of way. great article! there was an awesome meeting put on by asset mgmt. thursday at the crexent building in stuart, if they have another one its worth going to. IRSC is having a seminar on May 28.
i didnt know you were sitting so close to me, i guess ya had a front row seat. who is responsible to disclose that there is toxic drywallin the unit. If you don’t buy the condo from the builder who has to disclose the problem to you as a buyer?? If the seller/owner knows that the property exhibits the characteristics of toxic drywall then they need to disclose this information in their seller’s disclosure. If you are buying a property, it’s highly recommended that you have an inspection done by an inspector that is savvy about the drywall and how to look for indications. Generally when you make an offer on a property you have 7 to 10 days for inspection. If at that time you find the property has toxic drywall you should be able to get out of the contract. If you are purchasing a foreclosure, the owner – most likley the bank – will usually give you no disclosures but will allow you sufficient time for an inspection.